Yesterday, in a surprising yet also entirely unsurprising maneuver, the Angels came out of left field (baseball term) to sign free-agent Josh Hamilton to a five-year contract, worth $125 million. Other high-profile free agents have just recently signed — Ryan Dempster! Anibal Sanchez! — but Hamilton was the big fish, and he’s the guy most people are thinking about. He’s been one of the league’s biggest bats, and he signed with the Angels instead of re-signing with the rival Rangers, as was expected. No move sends actual shock waves, but if certain moves were to send shock waves, this would have been among them. There are almost countless reasons to be worried about Hamilton’s short- and long-term future. There’s a reason why everybody else was unwilling to guarantee five years, and there’s a reason this decision was apparently made over Jerry Dipoto’s head. A lot of people are worried that Hamilton could have an addiction relapse. A lot of people are worried that Hamilton’s body could break down, as he’s shown signs of physical fragility. At least one person is probably worried that Hamilton could morph into a butterfly and then what would the Angels do with a $25-million butterfly? What worries me, though, and what we’ve talked about here already, is Hamilton’s contact rate. For Josh Hamilton, 2012 was the most recent season, and it was a puzzling season. I don’t mean he made a habit of striking out against Felix Hernandez, although he did do that five times in seven plate appearances. I mean he made a habit of just generally swinging and missing and striking out. Hamilton struck out more often than ever before, by a significant margin, and he swung and missed with greater frequency than ever before, by a significant margin. Through 2011, Hamilton’s lowest contact rate was just over 72%, and in 2011, it was just under 75%. In 2012, it was just under 65%. In one way, Hamilton got worse; in another way, Hamilton was fantastic. Would Josh Hamilton’s 2012 performance be sustainable? Should we expect Hamilton’s contact rate to bounce back going forward? Let’s tackle the first one first. FanGraphs plate-discipline data stretches back to 2002, so I split all seasons, set a minimum of 400 plate appearances, and sorted by contact rate in ascending order. Along with contact rate, I looked at single-season wRC+, which I consider the best measure of productivity. Just how much of an anomaly was Hamilton’s 2012, through this lens? Hamilton is the point in black. This doesn’t look so bad. He’s at ~65%, and 140. Beside him is 2003 Jim Thome, at ~65% and 145. Right below him is 2007 Ryan Howard, at ~65% and 135. In 2011, Giancarlo Stanton had a 67% contact rate, and his wRC+ was 140. Seasons such as Hamilton’s have happened before, recently, according to this evaluation, so maybe Hamilton could continue to make it work. This is more troubling. Among all regulars and semi-regulars, Hamilton posted the second-highest swinging-strike rate during the FanGraphs Era. Only 2009 Miguel Olivo beat him, by a hair. The Hamilton point stands out. And keep in mind these charts select for players thought to be producing enough to keep playing, despite all the whiffs. They had to reach 400 plate appearances somehow. 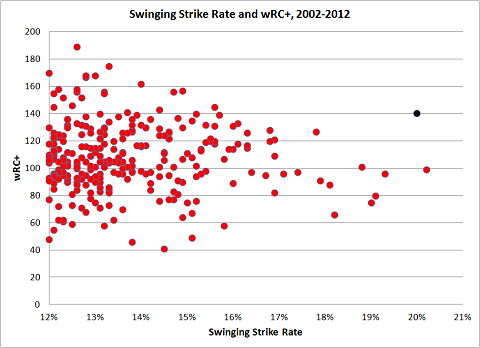 In 2009, Mark Reynolds posted a 127 wRC+ and a ~17% swinging-strike rate. That’s the closest successful comp to Hamilton’s 2012. Of the nine highest single-season swinging-strike rates, only one — Hamilton’s — came with a wRC+ over 101. Hamilton’s season has not been matched in the recent past. That doesn’t mean Hamilton couldn’t keep it up. Obviously, he is a tremendous natural talent, and sometimes players are exceptions. Hamilton did do what he did, after all, over a full season. But he got worse over the full season, after a torrid first two months. His swinging strikes increased, and after May he appeared a lot more mortal. I wouldn’t say pitchers figured him out, because Hamilton still hit reasonably well, but pitchers more frequently exploited his weaknesses. In Year 1, let’s set the group contact rate at 1. 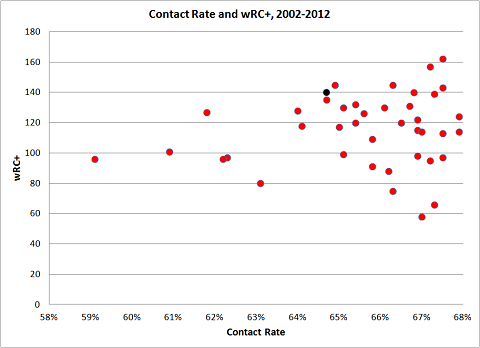 In Year 2, the average group contact rate was 0.92 — that is, on average, the players lost 8% of their contact rate. In Year 3, the average group contact rate was 0.96. There was a bounce back, half of the way. Granted, we’re dealing with a sample size of nine. Nine players, none of whom are Josh Hamilton. But I wondered about Year 0 — that is, the year before Year 1, obviously. In Year 0, the average group contact rate was 0.96. So, 4% lower than in Year 1. What we see is no change between Year 0 and Year 3. The players returned to what we might consider their original norms. The thing about Josh Hamilton is that, before 2012, he’d never approached such a low contact rate. He’d always hung out in the low- to mid-70s. The biggest decrease, by percentage, among all the players belonged to Morgan Ensberg, who lost 11% of his contact. He didn’t recover in Year 3. Hamilton lost 13% of his contact. No regular player, since 2002, has seen his contact rate drop season-to-season as significantly as Josh Hamilton just did. You knew that Hamilton’s career course was unusual. Covering recent history, you could call it unparalleled. So, there are indications that Hamilton’s contact rate could bounce back, some. Over the last 11 years, only Hamilton has been successful at the plate with a swinging-strike rate so high. What that doesn’t mean is that Hamilton can’t go another five years doing what he did in 2012. He’s a special talent, and he could be an exception to what you’d assume would be rules. But it’s a gamble to bet that Hamilton is an exception, on top of all the other gambles involved here. The gamble regarding the state of his body. The gamble regarding the state of his mind. The gamble regarding his transition away from the Rangers’ ballpark to a pitcher-friendly Angel Stadium. At the simplest level, Josh Hamilton has been really good, so the Angels should expect him to stay really good for a while. But there’s not a damn thing about evaluating Josh Hamilton that ought to be simple. Players don’t really get much more complicated. We hoped you liked reading Josh Hamilton Whiffing: an Investigation of Concerns by Jeff Sullivan!